During National Nutrition Month, Aramark and the American Heart Association are highlighting the many impacts of Healthy for Life 20 By 20—from expanded community programs to innovative menus and consumer engagement. Fueled by science and research from the American Heart Association, Aramark chefs and menu developers have been pursuing a variety of healthy menu impact strategies. By designing new menus and recipes, improving the nutrition content of existing favorites and sourcing the right ingredients, Aramark has achieved 75% of the calorie, saturated fat and sodium reduction targets for the Healthy For Life 20 By 20 initiative in only three years. Aramark is also expanding its reach, continuously engaging more and more consumers with Feed Your Potential 365, a destination for health and wellness tips and tasty and nutritious chef-driven recipes. Find these favorites, and more on our Feed Your Potential 365 site. 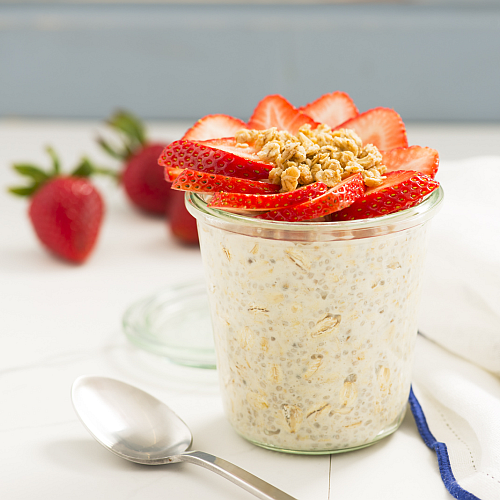 Strawberry Overnight Chia Oats—Heart-healthy oats and chia seeds combine with creamy yogurt and sweet strawberries for a quick breakfast you mix the night before. 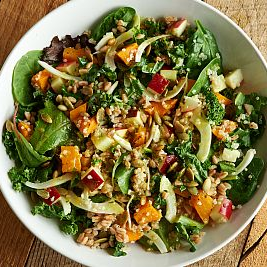 Fall Vegetable Salad—Whole grains quinoa and farro, roasted butternut squash, apple, fennel and a tangy ginger turmeric vinaigrette create a standout plant-forward meal. 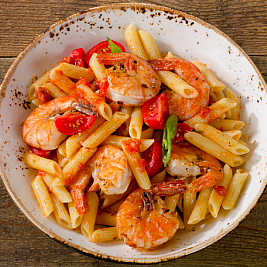 Spicy Shrimp and Penne—Shrimp, diced tomatoes and roasted red peppers are tossed in a roasted garlic-lemon broth and served over whole wheat pasta. Aramark reaches millions of consumers every year in more than a thousand foodservice locations, and through digital campaigns and social media. Together with the American Heart Association, Aramark educates consumers about nutrition and health, inspiring them to make healthy choices part of their everyday lives. This approach is working! For example, about 60 percent of consumers who were aware of a recent Feed Your Potential 365 healthy menu promotion chose the featured healthier selections. During National Nutrition Month, guests are encouraged to Eat Well and Live Well by choosing the Eat Well selections in Aramark’s business dining, higher education and healthcare locations. Every one of the Eat Well selections is lower in saturated fat, sodium and calories and has at least one full serving of nutritious ingredients such as fresh vegetables, whole grains, lean protein, beans or lentils or leafy greens. Visit aramark.com/healthyforlife to read the newest Healthy for Life 20 By 20 Impact Report, watch a video from Dr. Eduardo Sanchez, the American Heart Association’s Chief Medical Officer for Prevention, and more.